Bosanquet Ives sources, supplies and installs bespoke carpets on superyachts and in residences worldwide. Our custom-made carpets can be seen at our showroom in London or we can visit you with samples in locations worldwide. Bosanquet Ives can take care of all stages of installing your new carpets and rugs. We supply, manufacture, deliver and install carpets that can be custom -made or from out stock ranges. We can match existing carpet or assist when creating new designs.We can source a wide range of materials, including wool, bamboo and silk. Our 35 years of experience in planning, manufacturing and installing carpet and rugs allow us to offer a simple and straightforward service, ensuring your project is finished to the highest standard. Our services are available worldwide. Bosanquet Ives has been installing bespoke and hand made carpets for clients for over 30 years. 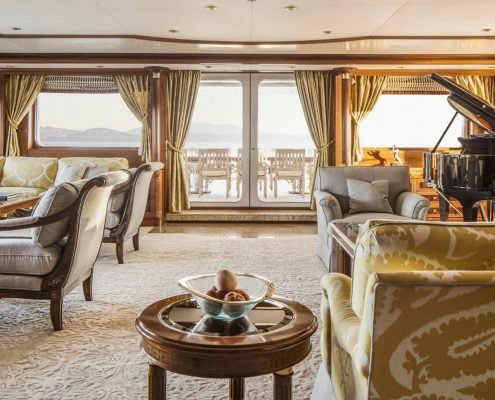 Although originally providing palaces, hotels and historic National Heritage properties with custom made traditional carpets, in the last 10 years we have focused on supplying IMO regulated, fire-retardant carpet, rugs and underlay for superyachts. Manufacturing processes may have significantly changed over the last 3 decades, but we still pay the same amount of attention while measuring, planning and fitting all our products. Bosanquet Ives supply and install beautiful bespoke carpets for yachts and private residences. We have a large portfolio of elegant designs and textures to choose from and can source the best hand-knotted, hand-tufted and pass machine carpets. We also carry stock ranges ideal for charter and crew areas. We are able to use our years of expertise to help guide you through every aspect of the process, from planning to final installation. We travel worldwide to measure and install our carpets and rugs.